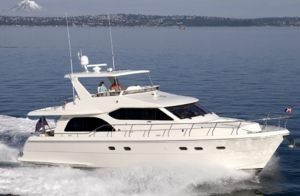 The Hampton 580 Pilothouse is the latest addition to the Hampton line of semi-custom power yachts. The 580 Pilothouse personifies the Hampton tradition of seamlessly blending power, sea worthiness and luxury. Quite simply, she represents the ultimate in long-range cruising comfort thanks to her potent twin 715 HP Cummins QSM-11 engines and her remarkably wide beam (17' 3"). This extra space leaves plenty of room for your ideas and personal touches. 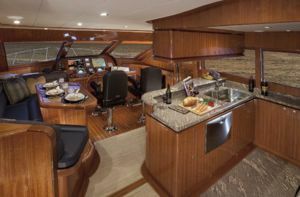 Because, as a semi-custom yacht builder, Hampton Yachts encourages every customer to select their preferred interior floor plans and woods, veneers, fabrics, materials and luxury appointments. And our design team will work with you to provide custom features that you may find desirable. 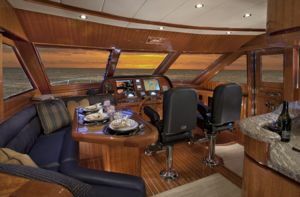 So, you can consider the new 580 Pilothouse as your personal comfort zone on the water. Like every yacht in the Hampton line, the 580 boasts a list of standard features, which are considered extras on most of our competitors' models. Nowhere is this more apparent than the 580's main Salon. From the plush padded carpet underfoot, to the overhead decorative redwood burl ceiling the 580 offers all the comforts of home. As standard you'll find a 37" HD/LCD TV with Bose surround sound system and DVD player. 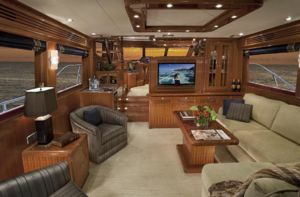 The Salon's 10 disc CD stereo also has speakers throughout the yacht, including the Cockpit, Pilothouse and Flybridge. You'll find a high gloss cherry wood (Makore) finish on all cabinetry. The L-shaped settee and chairs are upholstered in fine grain leather and the starboard side-table has a redwood burl top that matches the ceiling. The yacht's reverse cycle air conditioning system will always ensure cooler heads prevail. And the bright, frameless windows in the Salon are covered in custom blinds. 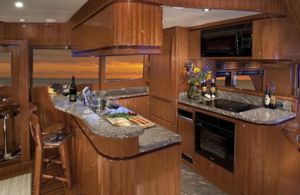 The 580 has a unique open Galley design that offers a complete through view from the Pilothouse to the Salon. This open design is ideal for entertaining, giving guests room to breath while you conjure up some delicious aromas. Guests can be seated on a custom built-in leather covered settee behind a large dinette with the themed redwood burl tabletop. The Galley has every modern convenience including full size refrigerator/freezer, electric cook top, oven and microwave, dishwasher, trash compactor and garbage disposal unit. The countertop and floor are available in elegant yet durable granite or Corian and the spacious sink is a boon for those on the clean up crew. Take your place in The Pilothouse. From the Pompanette Platinum Series helm chair you have a 180º commanding view through frameless windows. This is when you get a true feel for the 580's responsiveness and power. At your fingertips is a state-of-the-art control and instrumentation panel that can run almost every facet of the yacht. Easily accessed are the hydraulic engine controls, hydraulic steering with custom wheel, system indicator panel, water and fuel tank gauges, compass and electronics. 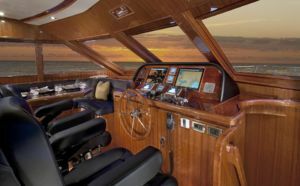 The rich, high gloss cherry wood (Makore) finish is continued throughout the Pilothouse and encases the control bulkhead. Stainless steel aircraft style doors are situated port and starboard for easy exterior access. The 580's Pilothouse also contains a custom-designed stairway to the Flybridge above and sumptuous Staterooms below. The 580's wide beam allows for a spacious 3 Stateroom / 2 Head designed floor plan. The Owner's Stateroom is a dream suite. Again, a decorative redwood burl ceiling looks down from above. 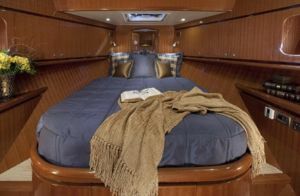 An opulent Queen size bed anchors both the Owner's and VIP Staterooms and, for the more practical among us, there are large drawers and storage beneath each berth. Need to relax before sleeping? Enjoy the LCD TV and DVD surround sound system in both suites. (Even the two-berth Mid Guest room has a built-in LCD TV and DVD.) And Hampton craftsmen have custom-created the built-in bureau, nightstands, vanity spaces and cedar-lined hanging closets throughout. It's the kind of attention to detail that every discerning yacht owner dreams about. The two Heads below are also refreshingly luxurious. The Owner's en suite has a Corian-lined shower stall, and both Heads feature appointments, finishes and fixtures that are second none; ITT Quiet Flush toilets, Grohe faucets and Corian countertops and floors. Controlling the 580 Pilothouse from the Flybridge gives you a whole new perspective on cruising. The semi-enclosed bridge has a complete instrumentation panel, hydraulic steering and engine controls, and it's also the perfect place to entertain alfresco. You can serve refreshments from the wet bar and fridge/freezer, then cook up the day's catch on the BBQ grill. Up top comes complete with a table and seating with storage, a tempered glass venturi, folding radar arch, air horns and searchlight. Access to the Cockpit below is from a built-in curved stairway at the rear of the Flybridge. Water sports enthusiasts will appreciate the generous storage cabinets and stand-up height in the Lazarrette. Perfect for diving or fishing equipment. The hot and cold shower unit is conveniently located near the swim ladder. A cockpit engine control station is also at hand with bow and stern thruster controls. And the engine room is accessible from the Cockpit via a watertight hatch with ladder. The Hampton 580 Pilothouse has power to spare in every area. Twin 715 HP Cummins QSM-11 engines with Racor Dual 1000FG fuel filters for each engine help deliver the ultimate in marine-performance. A side power 15 HP bow thruster is a must for maneuverability (stern thruster optional). Providing electrical power while underway is a Kohler 20 KW/60 HZ generator with sound shield. 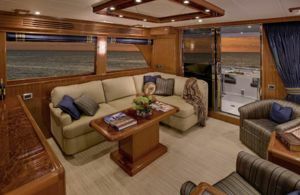 Every space aboard the 580 has been thoroughly thought through and the Engine room is no exception. No crawling or crouching is necessary thanks to the 6’3” headroom. All mechanical components, maintenance areas and filters are easily accessible. You will find that the wiring system complies with ABYC standards with proper numbering at termination points and routing of all circuits. Similarly, the yacht’s plumbing systems are well designed with every pipe and valve clearly labeled. Please click on Specifications for further details. The Hull is 100% hand-laid fiberglass molded in one piece with five outer layers of vinylester resin to prevent blisters. The Hull is reinforced with two layers of Kevlar from chine to chine and three layers of Kevlar in the forward collision zone. 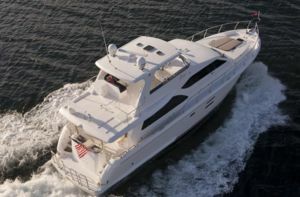 The 580 has a hand-laid fiberglass deck, deckhouse and Flybridge, all cored with high strength "Divinycell" foam. The standard Wesmar RS600 Stabilizer gives the 580 a soft, dry and comfortable ride. All decks are molded non-skid fiberglass. Hull/deck joints are through-bolted every six inches then sealed with 3M 5200 sealant, and covered with 3 layers of fiberglass. Also, all internal structural components are properly bonded to the Hull.